I’ve always done something creative, whether drawing, music, or short stories. 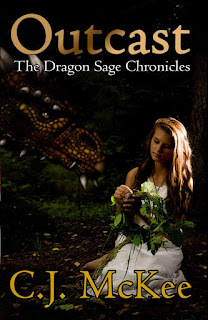 I started writing short stories as a teen, but it was many years later I started a short story that would eventually become Blood and Bane and the rest of the Dragon Sage Chronicles. I wrote different types of stories, sci-fi, fantasy, but I’ve always loved dragons. A lot of the stories or movies showed dragons as being bad. I wanted to create a world where they were not bad, rather good and the highest authority in the realms. My biggest influence was Ray Bradbury and of course Tolkien. My latest book is Outcast, also in the Dragon Sage Chronicles. My next book will be The Goblin Queen. In Outcast, a young girl and her village are terrorized by an outcast dragon. The dragon begins to focus on her as well and she must face the wrath of the villagers. But does she have a secret? The Goblin Queen will be about the growing force of goblins who eventually rise up against the humans of Arydd’liss? Are they being led by an unknown force? Cliché as it sounds, the writing. I love to create new worlds, characters and tell a story that appeals to people and makes them want more and able to “see” everything. I would say the editing, but honestly I do enjoy aspects of it that leads me to flesh out and bring out the best in the story. The least favorite is trying to gain the audience. Seems like there are tons of spammed books out there and it tends to get lost in the mix. Indie for sure. I have worked with a publisher before on a non-fiction book and although they did a great job, the marketing was severely lacking as was the promises. Once the option to self-publish was well established, and when it became required to have an agent for sending submissions to big publishers, I decided to self-publish and never look toward big house publishing again. Yes I also play hand drums, sometimes in drum circles, sometimes in bands or for bellydancers. Occasionally I play video games. I don’t have a schedule, except when I working through my edits, then I set a due date for release and work toward getting there. This helps me to stay on track. First time writing is a free for all! Hopefully with a well established audience and able to make a living from writing – as well as a few more books under my belt. Right along with the Sovereign Dragons of the mountain. I could be one of the humans that aids them.